This pattern is great for all skill levels from beginner to advanced. The easy universal method will result in a variety of color, shading and design options. This pattern works beautifully with our shaded hand dyed fabrics or it is also ideal for printed fabrics. 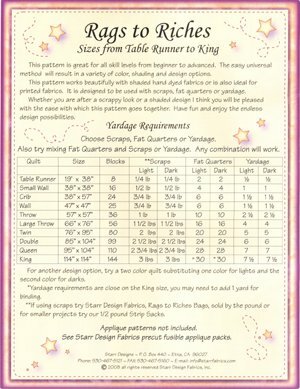 It is designed to use with scraps, fat quarters or yardage. It will make projects as small as a table runner and as large as a king size quilt.